(1) Mayberg, M.R., Batjer, H.H., Dacey, R., Diringer, M., Haley, E.C., Heros, R.C., Sternau, L.L., Torner, J., Adams, H.P. Jr and Feinberg, W., “Guidelines for the management of aneurysmal subarachnoid hemorrhage. A statement for healthcare professionals from a special writing group of the Council”, Stroke, Vol. 25 (1994), pp. 2315-2328. (2) Wootton, D.M. and Ku, D.N., “Fluid mechanics of vascular systems, disease, and thrombosis”, Annu. Rev. Biomed. Eng., Vol. 1 (1999), pp. 299-329. (3) McDonald, J.S., McDonald, R.J., Fan, J., Kallmes, D.F., Lanzino, G. and Cloft, H.J. “Comparative Effectiveness of Unruptured Cerebral Aneurysm Therapies Propensity Score Analysis of Clipping Versus Coiling”, Stroke, Vol. 44 (2013), pp. 988-994. (4) Molyneux, A.J., Kerr, R.S., Yu, L.M., Clarke, M., Sneade, M., Yarnold, J.A. and Sandercock, P., “International Subarachnoid Aneurysm Trial (ISAT) of neurosurgical clipping versus endovascular coiling in 2143 patients with ruptured intracranial aneurysms: a randomised trial”, Lancet, Vol. 360 (2002), pp. 1267-1274. (5) Park, S.H., Lee, C.Y. and Yim, M.B., “The merits of endovascular coil surgery for patients with unruptured intracranial aneurysms”, J. Korean Neurosurg. Soc., Vol. 43 (2008), pp. 270-274. (6) Hope, J.K., Byrne, J.V. and Molyneux, A.J., “Factors influencing successful angiographic occlusion of aneurysms treated by coil embolization”, AJNR Am. J. Neuroradiol., Vol. 20 (1999), pp. 391-399. (7) Raymond, J., Darsaut, T., Salazkin, I., Gevry, G. and Bouzeghrane, F., “Mechanisms of occlusion and recanalization in canine carotid bifurcation aneurysms embolized with platinum coils: An alternative concept”, AJNR Am. J. Neuroradiol., Vol. 29 (2008), pp. 745-752. 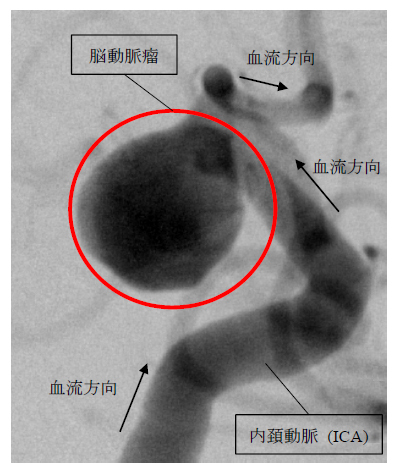 (8) Kwon, S.C. and Kwon, O.K., “Endovascular coil embolization of unruptured intracranial aneurysms: a Korean multicenter study”, Acta Neurochir., Vol. 156 (2014), pp. 847-854. (9) Sluzewski, M., van Rooiji, W.J., Rinkel, G.J. and Wijnalda, D., “Endovascular treatment of ruptured intracranial aneurysms with detachable coils: Long-term clinical and serial angiographic results”, Tadiology, Vol. 227 (2003), pp. 720-724. (10) Ford, M.D., Alperin, N., Lee, S.H., Holdsworth, D.W. and Steinman, D.A., “Characterization of Volumetric Flow Rate Waveforms in the Normal Internal Carotid and Vertebral Arteries”, Physiological Measurement, Vol. 26 (2004), pp. 477-488. (11) Ikeda, G., Sonobe, M., Kato, N., Yamazaki, T., Kasuya, H., Nakai, Y. and Matsumura, A., “Correlation between rupture or retreatment and the volume embolization ratio after coil emobolization”, Surg Cereb Stroke 2013, Vol. 41 (2013), pp.440-446. 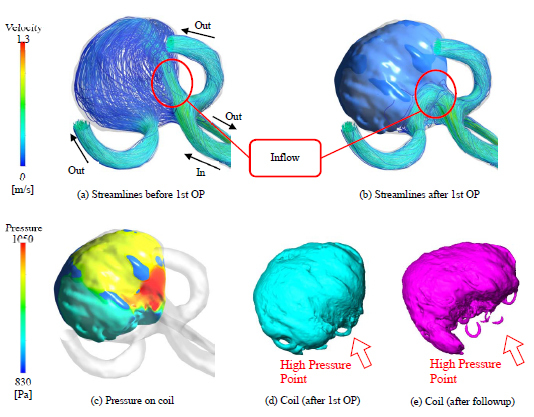 (12) Shimano, H., Nagasawa, S., Miyatake, S., Kawanishi, M., Yamaguchi, K., Kawabata, S. and Kuroiwa, T., “Nagasawa S, Miyatake S, et al : Model analysis of coil embolization of cerebral aneurysms: predict ion of thrombus formation in aneurysms based in the coil embolization rate”, Neurol Res, Vol. 28 (2006), pp. 172-176. 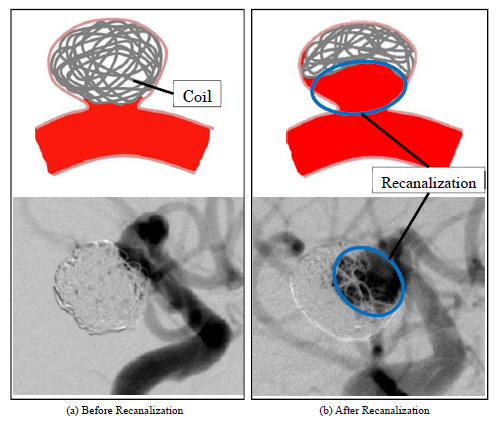 (13) Yagi, K., Satoh, K., Satomi, J., Matsubara, S. and Nagahiro, S., “Evaluation of aneurysm stability after coil embolization with Guglielmi detachable coils: correlation between long term stability and volume embolization ratio”, Neuro Med Chir (Tokyo), Vol. 45 (2005), pp. 561-565. (14) Babiker, M.H., Gonzalez, L.F., Albuquerque, F., Collins, D., Elvikis, A. and Frakes, D.H., “Quantitative effects of coil packing density on cerebral aneurysm fluid dynamics: an in vitro steady flow study”, Ann Biomed Eng, Vol. 38 (2010), pp.2293-2301.